The What: Radial Engineering has introduced the LX2 passive line splitter and attenuator. The LX2 is designed to easily send a single source to two different destinations at once without noise, with the ability to attenuate the input signal and tame hot outputs from a mixing console or mic preamp. The What Else: The input of the LX2 features an XLR/TRS combo jack, which allows you to connect balanced or unbalanced line level signals to be split to two different destinations. A premium Jensen transformer inside provides exceptional frequency response and phase coherency to ensure that the highest audio quality is maintained, while isolating the two outputs from each other to eliminate hum and buzz from ground loops. Ground lift switches on each of the two XLR outputs help to further reduce ground loop noise. For situations where a level adjustment is required, the trim control on the LX2 allows you to attenuate overly hot signals. This lets you drive your mic preamps hard to achieve coloration, while trimming the level at the LX2 to avoid clipping the inputs of your recording interface. This trim control is activated by a recessed “set-and-forget” switch; for live use or in situations where attenuation is not needed, simply disengage this switch to prevent accidental and unwanted level adjustments. The LX2 is built with 14-gauge steel to ensure it continues to reliably perform night after night even on the most demanding tours, while a bookend design protects the connections and switches. Rigid I-beam construction prevents torque from being applied to the circuit board, eliminating the possibility of cold solder joints. The LX2 has a compact footprint, with the added benefit of allowing up to eight units to be rack-mounted using the Radial J-Rak. 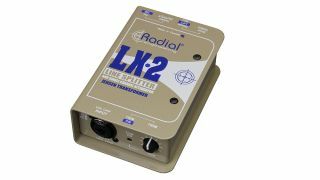 The Bottom Line: The Radial LX2 is engineered to be a versatile problem solver for an audio toolkit, providing Jensen transformer-isolated line level splitting and attenuation in a compact and rugged device.